The commercial capital of Sri Lanka and the true hub of all activity in the island, Colombo is a buzzing hotpot of cosmopolitan life. In this throbbing city, a heady mix of cultures thrives. Here, contrasting landmarks - ancient sites, colonial masterpieces and ultra-modern skyscrapers sit side by side. Quaint old shops and wayside stalls lie under the shadows of glittering stores and sprawling shopping malls. Similarly, lifestyles and traditions old and new continue, making Colombo a unique and exciting city. Arrival in Sri Lanka at Bandaranayeke International Airport and transfer to Colombo. You will be greeted by one of our Chauffer Guides at the airport. Proceed on a brief sightseeing tour of Colombo which includes Fort, Pettah, Sea Street, the Gangarama Temple, a National Museum, Old Parliament and the Town Hall only if time permits. The commercial capital of Sri Lanka and the true hub of all activity in the island, Colombo is a buzzing hotpot of cosmopolitan life. In this throbbing city, a heady mix of cultures thrives. Here, contrasting landmarks - ancient sites, colonial masterpieces and ultra-modern skyscrapers sit side by side. Quaint old shops and wayside stalls lie under the shadows of glittering stores and sprawling shopping malls. Similarly, lifestyles and traditions old and new continue, making Colombo a unique and exciting city. Its history dates far back: the port of Colombo was influential as early as the 5th century when ships from Rome, Arabia, and China traded with Sinhalese kings for food supplies, spices and jewels. The subsequent colonial powers also left their individual legacies – and the Portuguese, Dutch and English influence remains very much to date. Many of the grand colonial buildings are lovingly restored – as beautiful arcades or grand hotels, and many old period style homes as cafes, shops and guest houses. The colourful fabric of today’s society comprise Sinhalese, Moors, Tamils, Burghers (Portuguese, Dutch and British descendants), Chinese, and Malay populations. Several historical sites including ancient Buddhist temples, Hindu Kovils, churches, and mosques are found in the heart of the city as well. The attractions of Colombo are countless with many museums, art galleries, golf courses, gyms, spas and salons, bars, restaurants, night clubs, cafes and coffee shops to keep you busy. After early breakfast at hotel, leave to visit the famous Pinnawala Elephant Orphanage. The town of Pinnawala near Kegalle, on the route to Kandy has become a vital stopover for most travellers who flock to visit the famed Elephant Orphanage. Begun in 1972, the Elephant Orphanage at Pinnawala is a remarkable project created to protect abandoned or orphaned wild elephants who would not otherwise have survived in the wild. Relocated to the present size in 1975, today it has grown to become one of Sri Lanka’s key attractions. The elephants roam free within the sanctuary – and the highlight of their (and the visitors’) day is the feeding sessions and when they are led down to the river for a bath. From the banks of the river you can watch these gleeful herds of elephants splashing around freely on the river. The wildlife guides here will also provide you with background on elephants in Sri Lanka and their remarkable – and often fragile partnership with man. The nearby Eliphus Maximus project which produces elephant dung paper creates awareness on elephants as well as providing much needed employment to the village community. After breakfast proceed journey to Sigiriya to climb Sigiriya Rock fortress. The Sigiriya Rock Fortress is possibly Sri Lanka’s most famous historical site and attracts thousands of locals and tourists every year. The history as recorded in the ancient chronicles states that the Sigiriya Rock Fortress was built by King Kasyapa. Kasyapa was King Dhathusena’s son by a non-royal consort and thus was not an heir to the throne. Unable to accept this, Kasyapa killed his father usurping the throne which rightfully belonged to his brother Mogollan. Knowing that Mogollan, who fled to India, was bound to return and challenge him for the throne, Kasyapa moved the kingdom out of Anuradhapura and built his palace on the summit of the Sigiriya rock. Approaching the Sigiriya rock one can’t help but wonder how ancient builders accomplished the seemingly impossible task of building such an elaborate royal palace at the summit of this 200m high granite rock. This astonishing feature of engineering and construction had a highly sophisticated irrigation system which even went up to the palace complex atop the summit. In fact the irrigation system was so good that fountains which are found in a series of symmetrical pools still spurt water almost 1500 years after they were constructed. The entrance to the summit of the palace is guarded by a pair of giant lion’s paws which have been sculptured out of rock. The original entrance is said to have had visitors enter through the open mouth of a lion, but this has since perished. As if all this is not enough of a reason to visit the Sigiriya Rock Fortress, the famous Sigiriya frescoes which you encounter half way up the rock are truly breathtaking. The approach to the rock is well fortified with a complex rampart system complete with city walls and a moat. The view from atop the summit is breathtaking and enables you to take in the beautiful landscape for miles. Considered by most as Asia’s best preserved ancient city, Sigiriya is considered to be one of the oldest tourist attractions in the world. There is ample evidence of ancient visitors recording their impressions through a series of comments and verses scratched on the famous mirror wall of the rock in some of the earliest known graffiti. As Sigiriya is located in the harsh dry zone, it is best to climb the rock as early as possible as it does get very hot very fast! Thereafter, proceed journey to Polonnaruwa in the afternoon. The ancient city of Polonnaruwa 216 km northeast of Colombo is a cornerstone of Sri Lanka’s Cultural Triangle. One of the most significant kingdoms in Sri Lankan history this medieval capital (11th - 12th Century AD) remains a well-preserved city of ancient stupas, moonstones, beautiful parks, massive buildings and imposing statues. The ruins of this ancient city stay scattered over an extensive area of woodland and can be explored within a day. The city was enclosed by three concentric protecting the royal palace complex at its centre, the religious buildings - called Quadrangle, lie to the North and are very well preserved to this day. The largest monuments are found here including the buildings of the Menik Vihara, Rankot Vihara, Alahana Pirivena and Jetavana monasteries, the incredible Buddha statues of the Gal Vihara, the soaring Lankatilaka shrine, the majestic King's Council Chamber, the Lotus Bath are must see sights. And of course, the giant statue of Polonnaruwa's greatest king - Parakramabahu, and the vast ‘Sea of Parakrama’ – a 12th century man-made reservoir which dominates the city are not to be missed either. Breakfast. Proceed journey to Kandy. Visit Dambulla Golden cave temple en route. At Dambulla, we head off to the famed Golden Cave Temple in the morning. The famous Dambulla Rock Temple, also known as the Dambulla Cave Temple, is rich in history and cultural heritage. Standing approximately 100m high, the approach to the entrance of the caves entails climbing up the face of the rock, although stone steps have now been cut to make the climb easier. Whilst climbing to the entrance of caves, take time to stop and enjoy the view of the surrounding area, which is truly breathtaking. You can even catch a glimpse of the majestic Sigiriya rock a mere 20km away. Once within the caves one is treated to five separate caves, each offering a myriad of sculptures and murals of Lord Buddha, some of which are more recent than others.The caves initially served as a place of refuge for King Valagamba in the 1st Century BC when he fled his throne in the then capital of Anuradhapura to escape the invaders from South India. The caves offered the King a place to dwell for 15 years. However, King Valagamba went on to regain his throne and had the interior of the caves carved into the beautiful rock temple in gratitude for offering him refuge. Subsequent rulers of Sri Lanka also added to the adornment of the caves, thus ensuring it remained a major religious shrine. King Nissanka Malla from the Polonnaruwa period was responsible for gilding the caves and the addition of 70 Buddha statues in 1190AD. The Golden Temple of Dambulla was declared a UNESCO World Heritage site in 1991. In the afternoon, visit the city of Kandy with an artificially created decorative lake in the heart of the city and surrounded by rings of wooded mountains. Kandy, the Cultural Capital of Sri Lanka is home to numerous Buddhist temples including the most sacred of all, the Holy Temple of the Tooth Relic. In the evening, visit the Temple of the tooth. The Dalada Maligawa or Temple of the Tooth Relic is home to Sri Lanka’s most sacred Buddhist relic – a tooth belonging to Lord Buddha. The shrine receives many worshipper and visitors throughout the year but is particularly busy on Poya days. The temple is located in close proximity to Kandy town and the Kandy Lake and remains a high security area. Those visiting the hallowed grounds of the temple must take care to dress in an appropriate manner ensuring that their legs and shoulders are covered. Footwear must also be removed before entering the temple premises as an act of respect. The tooth itself is not on display as it is kept in a gold casket shaped like a Dagoba which itself contains a further six caskets. The sacred tooth is said to have been smuggled onto the island during the 4th century AD concealed in the hair of a princess. The tooth was considered a symbol of sovereignty and it was believed that its custodian had the right to rule the country. Thus the sacred tooth relic has journeyed across the island having spent considerable time in each of the ancient kingdoms until it reached its final resting place in the ancient hill capital of Kandy. The temple complex itself was constructed by many Kandyan Kings who ruled the region from 1687 and was considered to be a part of the Kandyan Royal Palace. The main tooth shrine is the Vahahitina Maligawa which is a rectangular building which is positioned in the centre of the paved courtyard. It is an accepted belief amongst Sri Lankan Buddhists that they must pay homage to the Temple of the Tooth Relic at least once in their lifetime. After visiting the temple in the evening and enjoy the Kandyan Cultural Show at the Kandyan Arts & Cultural Centre. The show features the graceful and rhythmic dancers and drummers culminating in an impressive fire walking display. Thereafter, visit Peradeniya Royal Botanical garden famed for its wide variety of orchids, among other flora and fauna. Attracting approximately 2 million visitors a year, the Peradeniya Botanical Gardens was established as far back as 1371 during the reign of King Wickramabahu III. Originally restricted exclusively to members of Kandyan Royalty, the Peradeniya Botanical Gardens is rich in history as well as in an abundance of nature’s most spectacular creations. Officially established in 1843 with plants brought from the famous Kew Gardens, the Peradeniya Botanical Gardens is home to more than 4000 species of plants. While the gardens are most renowned for its exceptional collection of orchids, it is also home to many varieties of spices, medicinal plants and palm trees, as well as an abundance of flowering plants and trees. The Avenue of Palms located in the gardens include a tree known as the Cannonball Tree which is filled with historical significance. It is said that this tree which is often laden with fruit that are thought to resemble cannon balls, was planted by none other than King George V and Queen Mary in 1901. The Botanical Gardens have a strategic location being on the banks of the island’s largest river, the Mahaweli Ganga. While the Gardens have been watched over by many King from the Kandyan Kingdom, it was also used by Lord Mountbatten, who was supreme commander of the allied forces in South Asia during World War II as the headquarters for the South East Asia Command. History aside, the Peradeniya Botanical Gardens makes for an extremely pleasant visit where you are likely to come across an array of plants and trees which you are otherwise unlikely to encounter. A leisurely visit is recommended so that you are able to truly enjoy the wonders of nature in all her splendour. Thereafter go on to Nuwara Eliya, often, known as “Little England”. This hill country is covered in acres and acres of tea plantations and flowing waterfalls. Hidden away high in the central mountains at an altitude of over 6000 feet, Nuwara Eliya is the resort capital of the hills – and a world away from the hot tropical beach atmosphere of the coast, not just in climate but in its character too. The British planters who flocked to the region to grow tea in the mid-19th century developed Nuwara Eliya as their summer retreat. Created as an exact replica of an English town it is often called ‘Little England’; and with its primarily colonial architecture, the stately Victoria Park, golf course, racing track, boating lake and grand period style hotels – and the cold, frequent showers of rain adding to the illusion, you could well be in an old English country town. This is the heart of the tea country, and is also a good base for excursions to discover other attractions of the hills. Sri Lanka’s tallest mountain range ‘Pidurutalagala’ looms over the landscape, the surrounding forest is a treasure for nature lovers and the Hakgala Botanical Gardens close by is known for its roses and rare ferns. In the evening take in a city tour of the town. A pre-dawn start to reach Horton Plains with picnic breakfast. Spend the morning exploring Horton Plains for highland endemics , flora and fauna. World’s End is situated in the Horton Plains National Park, which is the only national park in Sri Lanka where visitors are allowed to walk on designated trails unaccompanied. World’s End itself is a sheer cliff which drops almost 4000ft allowing for a breathtaking view of the world below. On a clear day vistors can expect to see mountains, tea estates and even the coastal area in the distance. It is claimed that on extremely clear days the Indian Ocean which is almost 81km away is clearly visible. However, the mist usually comes in around 9am or so, is it best to try and reach World’s End by around 7am.World’s End is located approximately 4km from the entrance of the park but the trail takes a circular route which makes the complete journey a 9.5km hike. World’s End has two parts, names Small World’s End and Big World’s End, which are approximately 1km apart from each other. It is best to avoid Sundays and Public holidays as these days tend to get extremely crowded which doesn’t allow for soaking up the true atmosphere of the area. You will first visit the Baker's falls and then arrive at the World's End cliff covering approximately 3km. To get to the Baker's Falls, you have to deviate from the main trail and go approximately 500m on a very difficult downward path. Take pictures at these locations to take your memories home. Most of the day both small and big "World's Ends" are covered with mist and clouds. So, one must have patience to wait at these points for clouds to clear up to get a glimpse of a steep drop and a tea estate beneath World's End. The big World's End has a sheer drop of 3700 feet. Proceed on a short sightseeing tour of Negombo only if time permits. The primary resort town on the western coast of Sri Lanka, Negombo is highly sought after for its long stretches of golden, palm fringed beaches and the buzzing, cosmopolitan lifestyle of the town and of course, its close proximity to the airport at Katunayake. The economy of the town and the region is mainly based on tourism and its centuries-old fishing industry which continues to thrive today – making it a paradise for seafood lovers. Here, myriad cultures mix and exist freely. The town, which is predominantly Roman Catholic, is called “Little Rome” due to the highly ornate Portuguese-era Roman Catholic churches found within it. However, Buddhists, Hindus and Muslims too have significant landmarks of their own – often next to each other. Several buildings also date back to the Dutch and Portuguese colonial era, including an ancient Dutch Fort gate built in 1672 now a part of the prison and the Dutch Canal which was a supply route to the administration. The 100km long canal – still very much in use, runs through and a boat ride will offer a different perspective of the city. The wide beaches and the gentle surf are ideal for water sports and a few well preserved coral reefs and a 50 year old shipwreck attracts divers too. Negombo is a popular fishing town in Sri Lanka, located on the west coast of the island near the Negombo Lagoon. The Negombo Fish Market is the second largest fish market in the Island and is a noisy, colourful and even smelly affair! It is situated near the Old Dutch Fort Gate and is definitely worth a visit to experience local culture and enjoy seeing the many variety of fish and seafood being offloaded from the boats. Fish that are captured from other neighboring towns such as as Wennappuwa, Marawila, Chilaw, and Kalpitiya are also transported to the Negombo Fish Market. . Varieties of fish on sale would be shark, tuna, sardine and mackerel .Live crabs, shrimp, lobster and prawns are plentiful too for sale at the stalls in the market. The fish is laid in heaps for display and is quite an interesting sight to see. They can be purchased in bulk or in smaller quantities. The price is very economical in comparison to what you would pay at a supermarket or commercialised fish store. So if fresh fish is what you need for a scrumptious lunch or dinner, or just to experience the native fishing industry, a visit to the Negombo fish market is highly recommended. The fish market is situated near the Old Dutch Fort Gate and held every day except Sundays and evenings. The fishermen who are based at the Negombo lagoon live in abject poverty in shanty thatch palm villages along the water's edge. They rely mainly on their traditional knowledge of the seasons for their livelihood, using outrigger canoes carved out of tree trunks and nylon nets to bring in modest catches from September through till April. Their boats are made in two distinct forms, oruvas (a type of sailing canoe) and paruvas (a large, man-powered catamaran fitted with kurlon dividers), and are said to have originated in the islands off the Mozambican coast; they were brought to Sri Lanka by Portuguese traders in the 17th century. For generations the lagoon has provided the fishermen with a plentiful supply of crabs, shrimps, lobsters, cuttlefish and many of the native species of fish. Enjoy beach stay till late evening. Breakfast. Full day relax at the beach. Breakfast. 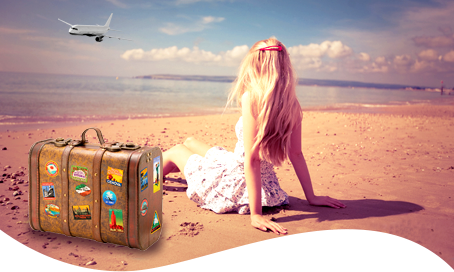 It’s time to bid good bye to the charms of our tropical island, and leave for your return flight to the airport. Transferring to the airport to catch the flight to onward destination.